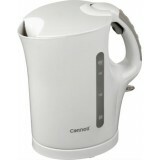 Safety locking lid Automatic switch-off: Kettle automatically switches itself off when water has boiled Lift switch off: The water kettle automatically switches itself off when removed from it's base ..
Removable limescale filter Safety locking lid Automatic switch-off: Kettle automatically switches itself off when water has boiled Lift switch off: The water kettle automatically switches itself off when removed from it's base ..
Cornell CJK-S105TVL Travel Kettle 120V / 220-240V~, 50/60Hz, 550-650W / 0.5L Concealed heating element Removable filter On/Off switch illuminated, water level indicator Cord storage Comes with two cups convenient for travelling ..
Cornell CJK-S10L Jug Kettle Capacity 1.0L Convenient One Press Hinged Lid Removable Scale Filter For Easy Cleaning Convenient Cordless Jug Power : 750-900W Convenient One Press Hinged Lid Removable Scale Filter For Easy Clean..
Cornell CJK-S17L Jug Kettle Capacity 1.7L Convenient One Press Hinged Lid Removable Scale Filter For Easy Cleaning Convenient Cordless Jug Power : 1850-2200W ..
Water Gauge Water level indicator located on the back of the kettle. Swivel Base 360 Degrees Swivel Base. Detachable base for cord- free convenience. Anti- scale Filter Removable and washable anti- scale filter. 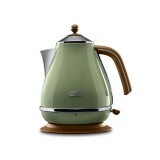 ..
Delonghi KBI2001 Distinta Electric Kettle Sophisticated matt metallic finish with chromed details. Metal wrapped touch points 360° swivel base. 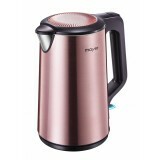 Detachable base for cord-free convenience Water level indicator Flat stainless steel concealed element .. The Fabulous Italian '50 Kettle with 1.7 lt capacity and a painted stainless steel body WATER GAUGE - Water level indicator located on the back of the kettle SWIVEL BASE - 360° swivel base. 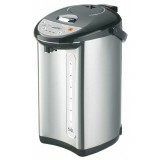 Detachable base for cord-free convenience ANTI-SCALE FILTER - Removable .. 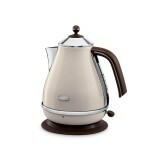 The elegance, sophistication and retro design of a Vintage object Kettle with 1.7 lt capacity and a painted stainless steel body Details: CAPACITY: 1,7 l. Unique high gloss finish with chromed details and embossed particulars 360° swivel base. 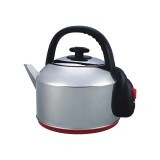 Deta..
IONA GLK4200 Stainless Steel Kettle Stylish contemporary design Quick boiling Durable UK STRIX Controller Automatic Boil Dry Cut Off High Grade Polished Stainless Steel Body Safety Locking Lid Concealed ..
IONA GLK4800 Stainless Steel Kettle Functional, simple and stylish, the Iona GL4800 traditional kettle in a polished stainless steel will bring style to your morning routine. 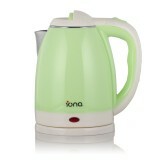 With a generous family-sized 4.8L capacity you will not have to ..
IONA GLK150 Cordles Kettle The Iona GLK150 kettle will make a welcome addition to your kitchen. 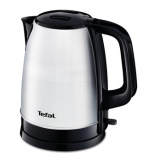 In a stylish stainless steel or white finish, this kettle has a powerful 3kW boil ensuring a fast and efficient boil at all times. 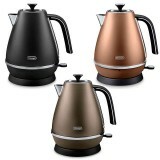 A larg..
Iona GLK188 Cordless Electric Kettle(1.8L) Introducing the latest and functional IONA 1.8L Cordless Kettle that boils water quickly with concealed heating element, cord storage, cool touch handle and rotatable base Features Fast & easy boiling 1.8L Large .. 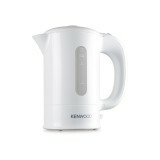 The white JKP250 Jug Kettle The Kenwood JKP250 Discovery is a compact, 0.5 litre jug kettle, specifically designed for travelling and for small kitchens. 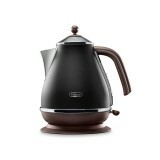 The striking kettle includes two cups and spoons stored inside. 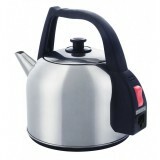 Innovation The JKP250 kettle has dual voltage for use in.. The Collection The kMix Limited Edition range comes in a luxurious rose gold finish and is sure to make a bold statement in the kitchen. The exclusive collection is the perfect balance of style and performance. 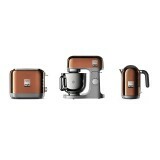 kMix Limited Edition Stand Mixer The stunning stand mixer is th.. Brew up for the whole family or friends with a generous 1.6l capacity, with 1 cup saver so you can clearly measure how much water you need - less energy, less waste. 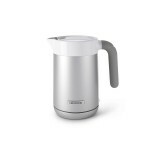 A double wall construction of the kettle's body keeps the noise inside, and the flip lid makes it easy to use the kettle si.. 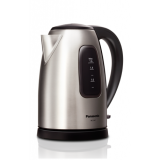 Highlight 1.7L Capacity Rapid Boil (Energy & Time Saving) On/ Off Switch with Indicator Light Food Grade Stainless Steel Body & Inner Pot Double Wall Kettle Fully Sealed Seamless Liner for Easy Cleaning Stainless Steel Filter 360 Deg..
Come with Dry Boil Safety protection Detachabe lid for easy cleaning Adjustable Temperature for Storage at 65, 85 or 98 Degrees Celcius Different Ways of Dispensing Water - Touch Cup ..
Mistral 1.5L Electric Kettle come with food grade stainless steel body & inner pot which can produce consumer healthy hot drinks in just minutes. 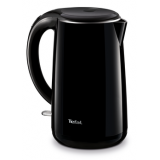 With its double stainless steel seamless liner body, it prevents from scalding & keeps the contains warm for a longer time yet saves energy &am.. This kettle is designed to be cordless to create ease for users. 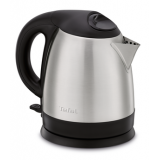 The automatic switch off function & dry boil protection allows you to set your water on boil without you worrying to not switch- off the kettle once it's boiling. 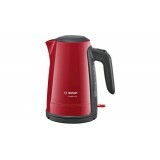 It also comes with a high quality stainless steel body & .. 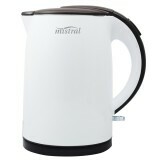 This Mistral Electric Kettle 4.8L is fitted with a thermostat to prevent overheating and has an auto switch- off feature whenever the water is boiling. 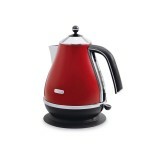 The kettle also has a cool touch base whcih prevents your table or countertop from getting damaged due to extreme heat. 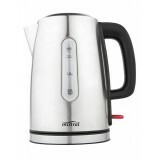 With a high power heater,..
Detachable 360-degree pirouette base Dual water windows with water level indications Easy lid or spout filling ..
Detachable 360- degree pirouette base Dual water windows with water level indications One push button for opening the lid ..
Lovely 1.2 L stainless steel compact kettle: Boil only the cup you need for your daily tea moments Compact 1.2 L premium stainless steel kettle at the best price: simply prepare the hot cups that you need for all your friends and family. 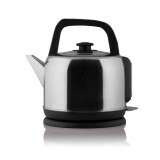 This kettle will perfeclty fit in.. 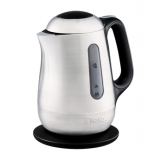 Ideal to prepare your best hot beverages thanks to Tefal Stainless steel kettle 1,7L Choose the perfect kettle for your tea or coffee sessions with your family or your friends! 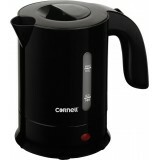 Handy and convenient : 1.7 L of water : a such capacity will delight all the family, Kettle with .. 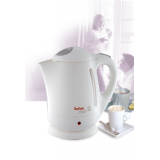 Safe'tea 1.7L heat protection electric kettle Safe'Tea wireless kettle features double layer insulation that keeps heat inside. Indeed, thanks to an external plastic layer your hands stay protected while water stays hot in a full stainless steel inner bowl. Prepare tea for .. 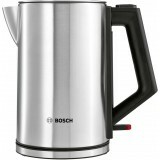 Enjoy all your hot beverage times thanks to a well-finished stainless steel kettle! 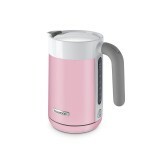 Handy and convenient : 1.7 L of water : with such capacity, there will be enough for all the family, Kettle with a stainless steel body, Concealed heating element to have no direc.. 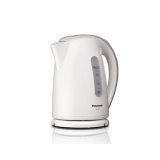 This stylish white kettle has a rapid boil, hi-speed element so you no longer have to wait impatiently for your morning cup of tea. The concealed stainless steel element extends the life and efficiency of your kettle and the large extra fine mesh, removable filter prevents lime..